I am giving away a $10 Amazon Gift card. Giveaway will end on Sep 8, 2012 at midnight PST. Must be 13+ and live in the US. Only one entry per person – extra points for following. Winner has 48 hours to respond or another will be selected. Giveaway closed – Winner has been emailed. Today is National Trail Mix Day. Nothing better than taking a little hike with some trail mix. Here is an easy recipe for some good trail mix. Mix all. Makes 4 cups. Today is National Toasted Marshmallows Day. 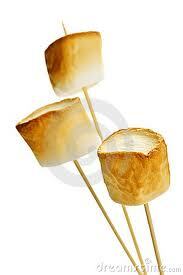 What brings back memories and feel more like a kid than a lightly toasted marshmallow on a stick. Enjoy some today! Today is National Lemon Juice Day. 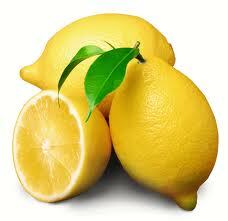 Who doesn’t like that nice clean smell of lemons or a fresh squeeze of lemon on your fish and chips? Cut a lemon and put it in your water to make it taste fresh, then throw the lemon down the garbage disposal to help it stay fresh smelling. Forever and a Day is number 6 in “A Lucky Harbor Novel” series. I really enjoyed the first books so was excited to read “Forever and a Day” and I was not a disappointed. Grace comes to Lucky Harbor after quitting a dream job or so she thought until she met the boss who wanted more than just work from her. She is a friend with Amy Michaels and Mallory Quinn who met over chocolate cupcakes and discusses their personal lives or mostly in this book Grace’s life. Her bank account was running low so Grace was taking odd jobs including modeling for an art class, delivering flowers, book keeping jobs and even took a job walking a dog for the hot ER doctor. Josh is a busy doctor with a practice, small son, dog and a sister who all wants and need his attention. Josh needs help with his family and hires Grace to watch his son Toby until she finds another job, and offers his guesthouse for her to live in. Josh is tough and thinks he never needs help with anything, which is until he meets Grace. Grace becomes a shoulder for not only him but his younger sister to lean on. I liked seeing how things end with Grace and Josh. I would like to give away my copies of these three books by Jill Shalvis, Lucky in Love, At Last, and Forever and a Day. These books have been read by me so they are not new, just gently read. Must be 18+ and live in the US, only one entry per person/per email. Giveaway ends Sept 2, 2012. Fill in the form below – must follow in at least one way, extra enters for each way you follow. Contest over – winner will be posted shortly. Unroll crescent roll dough and separate into four squares; place on an ungreased baking sheet. Press seams and perforations together. Spoon 1/4 pie filling in one corner of each square. Fold to make triangles; pinch to seal. Bake at 375° for 10-12 minutes or until golden. Combine sugar and milk to achieve drizzling consistency. 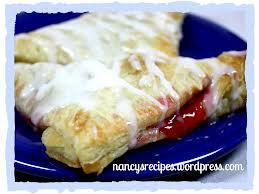 Drizzle over turnovers; Serve warm. Yield: 4 servings. Today is National Dog Day, man’s best friend, and not just because they love you so much they literally jump for joy when they see you. Dogs also help lead the blind and help police and rescues forces. 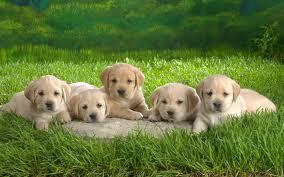 Make sure to give your dog a treat today and take him for a walk. 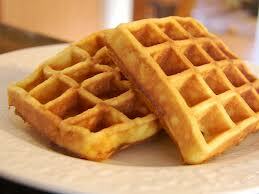 Today is National Waffle Day. What are your favorite kind of waffles? My favorite are bacon waffles. Do you have any good recipes? I love Yankee Candles and have a candle burning most of the time when I am home. I just recently started using tart burners. I think when using a tart burner the scent is a bit stronger and fills a large room. I also like the fact that I have only invested $1.99 on a tart and if I don’t like the scent I am not out that much money; even though I know that Yankee Candle is very good with returns. If you get a candle and do not like it when you burn it you can always return it for something you like. I also like being able to burn a wide variety of different scents. My all-time favorite scent is Cherry Lemonade but I also like the fall scents like Pumpkin Pie or Harvest. It is very easy to change the scents also – the wax never dissipates so what you do is wait till the wax hardens and then put the tart burner in the freezer or put a few ice cubes on the harden wax wait 10 minutes and it slides right out. I am giving away a Yankee Candle Tart Burner along with 10 assorted tarts including my favorite Cherry Lemonade, Sparkling Lemon, Midnight Jasmine, Spa Fresh, Buttercream and 5 others. Giveaway starts August 23 and runs through August 29th ending at 12 PST. You must follow me in at least one way, be 18 + and have a US mailing address. Please fill out the form below. Winner will be contacted by email, you must respond in 48 hours or another winner will be drawn. This contest is now closed – Winner will be contacted today. Today is National Sponge Cake Day. What makes Sponge cake more spongy than other cakes? The eggs are whipped into a foam and then added to the cake. Here is a great recipe to try. Preheat the oven to 350 degrees F. In a small saucepan, warm the milk and 2 teaspoons of the butter together over medium-low heat. With an electric mixer fitted with a wire whip, beat the eggs and 1 cup of the sugar on medium-high speed in a large mixing bowl until the mixture is pale yellow, thick, and tripled in volume, about 8 minutes. With the mixer on low speed, beat in the warm milk mixture. Sift the flour, baking powder, and salt into a small mixing bowl. Add half the flour mixture to the egg mixture and blend thoroughly until smooth. Repeat with the other half. Add the vanilla and mix gently. Grease a 17 by 12-inch baking pan or jelly-roll pan with the remaining 2 tablespoons butter. Sprinkle evenly with the remaining 2 tablespoons sugar. Pour the cake batter into the pan, spreading it evenly. Bake until the cake springs back when touched, about 15 minutes. Cool for about 2 minutes, then gently flip it out onto a large sheet of parchment paper. Let cool completely.